Heads up, yah filthy animals! 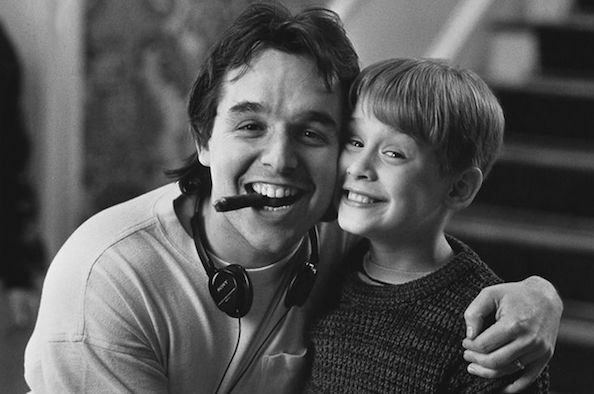 We're tossing 5 fun facts about Home Alone your way! We have Chevy Chase to thank for director Chris Columbus’ involvement. Chris Columbus was originally hired by John Hughes to direct National Lampoon’s Christmas Vacation; however, after 2 meetings with Chevy Chase, Columbus told Hughes, “There’s no way I can do this movie. I know I need to work, but I can’t do it with this guy.” Hughes then sent Columbus two scripts, one of which was Home Alone. When the milk is spilled on the counter after the cheese pizza confrontation in the kitchen, Peter McCallister cleans up the mess to save the family’s passports and airline tickets; however, as he tosses the damp napkins in the trash, he also disposes of one lone ticket by mistake. If you look very closely, you’ll find a name on the ticket in black marker that reads: Kevin. Special effects done dirt cheap. All the computer effects for the film were done by a guy (Kevin Nordine) in the basement of his parents’ Chicago home. Nordine hand drew the effects (like the BB pellet and Harry's tooth) directly onto the film, and he only charged a few hundred dollars for his services. His only other film credit is another Hughes’ project, Curly Sue. Daniel Stern’s reaction to the tarantula on his face was 100% real. The production decided that they couldn’t use a mechanical tarantula because it wasn't convincing enough, so they settled on using the real thing, which still had its poison stinger — that couldn’t be removed because it would kill the animal. Stern was told by the animal handlers that he could scream as shrill as he wanted because tarantulas don't have ears. The end result was genuine and what Stern refers to as "straight outta Psycho." We can thank Chris Columbus for the solid ending. The original John Hughes ending was a freeze frame of Kevin after he said, “Oh, you know, just hanging around.” It was actually Chris Columbus’ idea to add the character of the snow shoveling neighbor, Old Man Marley (which is a nod to Scrooge’s business partner in Charles Dickens’ A Christmas Carol). The addition of this character gives the film a sense of complete, non-cheesy finality. Columbus even uses Marley in a visual metaphor that subtly reinforces the film’s central themes. 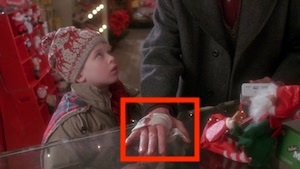 When Kevin first encounters Marley, he has a bandaged wound on his hand, which gradually heals over the course of the film; the bandages go from tons of gauze to a large bandage, before, finally, it’s completely healed. Well, that's our list. Let us know your thoughts and feelings in the comments section below, and as always, remember to viddy well!